Life Floor outdoor foam tiles have been designed to be a premium worry-free solution for barefoot traffic on wet surfaces. 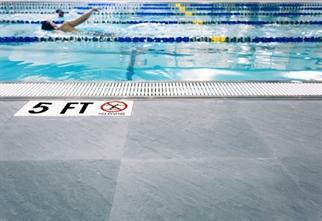 These tiles are perfect for outdoor decks, patios, pools, in showers, bathrooms, locker rooms, saunas, underwater in pools, playrooms, games rooms, and many other areas where a safe, non-toxic, slip-resistant floor is desired. Slip resistant and soft, these floor tiles will give you a functional yet comfortable area where children and adults can run and play with reckless abandon. These tiles have the potential to be quite cooler than standard stone or tile floors. With several colors and patterns to choose from, we are sure that with this safety floor tile you will once again be able to enjoy any outdoor area. Life Floor foam tiles are made with patented EvaTrax technology which is a non-toxic, UV-stable foam-rubber. 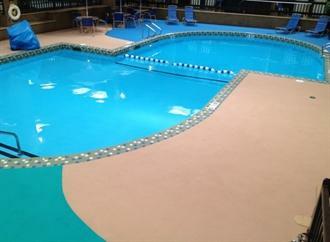 PolySoft Splash is a flexible seamless surface solution, ideal for various wet areas. The surface temperature of PolySoft is cooler than traditional finishes such as concrete, asphalt and rubber. PolySoft provides an excellent independently verified anti slip rating for both wet and dry applications. PolySoft is easily repaired if vandalised with little or no visible seam. A specially developed two part aliphatic polyurethane binder is used in all PolySoft installations. This coupled with colorfast technology, protects against premature fading and provides excellent resistance to UV radiation and to chemicals such as chlorine. PolySoft is hygienic and easy to maintain. PolySoft is customisable; allowing the integration of patterns and logos into the surface design. PolySoft Plus – PolySoft Plus system has been formulated to hinder the growth of fungi/algae prevalent in moist and warm environments. Incorporated additives developed by the PolySoft team greatly reduce the opportunity for such growth.